Burmeister & Wain recently an- nounced that 29 of 44 vessels or- dered by Hon}? Kong shipowners for delivery in 1980-81 will be equipped with B&W engines. GFC(A) for 18 of the 24 ships ordered for delivery in 1980-81. In addition, two 6L80GFCA (Japanese License built) will be delivered for installation in ships built by Kawasaki Heavy Indus- tries, Ltd.
Ltd., headed by chairman T.Y. Wain's L-GFC for 11 of 20 ships ordered for delivery in 1980-81. GFC, and three 6L67GFC en- gines; Hitachi—one 6L67GFC engine. POL's agents in the U.S. and Can- ada, has announced the appoint- ment of Ronald G. Davie as re- gional sales manager, New York. Lines, ACT/Pace Lines, and U.S.
Gulf Trading & Transporta- tion Company (GT&T), a division of Gulf Oil Corporation, Pitts- burgh, Pa., responsible for ma- rine transportation and the sup- ply, sales and trading of foreign crude oil, will transfer its head- quarters and the bulk of its op- erations to Houston, Texas. Gulf's refining and production di- visions. This need now dictates our move to Houston." Gulf Oil Exploration and Produc- tion Company, and Gulf Oil Chem- icals Company—moved their head- quarters to Houston. Pittsburgh area. Approximately 180 GT&T employees will be in- volved in the move. The GT&T move to Houston will begin in April, and is sched- uled to be completed in September of this year. Model 6410 and Model 6425 are also superb back-up radars for large, high-seas vessels. Each features a big 10-inch display in an extremely compact unit that may be pedestal, bulkhead, table-top, or overhead mounted. A number of extra- performance options are available including gyro-stabilization now required on large ocean-going vessels. River models are also available with statute-mile ranges, stern flasher, and off-centering. 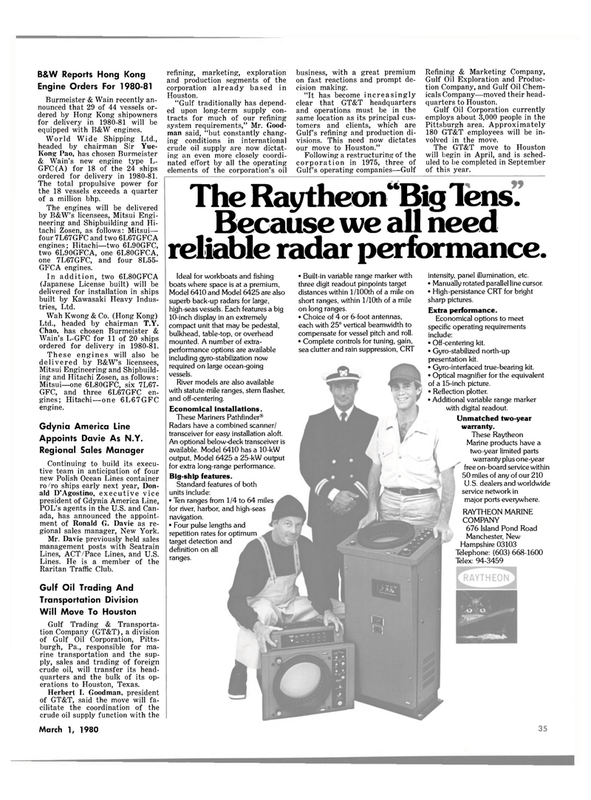 Radars have a combined scanner/ transceiver for easy installation aloft. An optional below-deck transceiver is available. Model 6410 has a 10-kW output, Model 6425 a 25-kW output for extra long-range performance. Standard features of both units include: • Ten ranges from 1/4 to 64 miles for river, harbor, and high-seas navigation. • Four pulse lengths and repetition rates for optimum target detection and definition on all ranges. intensity, panel illumination, etc. • Manually rotated parallel line cursor. • High-persistance CRT for bright sharp pictures. Economical options to meet specific operating requirements include: • Off-centering kit. • Gyro-stabilized north-up presentation kit. • Gyro-interfaced true-bearing kit. • Optical magnifier for the equivalent of a 15-inch picture. • Reflection plotter. • Additional variable range marker with digital readout. U.S. dealers and worldwide service network in major ports everywhere.